Cron job is a process to run a page automatically in background without interrupting user. You can execute a page automatically at any time on daily basis by setting up a cron job. I have already explained about setting up a cron job on godaddy server in one of my article. So now here I am going to explain a step by step process for setting up cron job in AWS too for ubuntu users. Step #1. Login to your AWS instance through Terminal by using your server credentials. Step #2. Type crontab -e.
Step #3. Now editor will open inside your terminal that will look like below.. Step #4. You have to add your script command inside it as below. After setting cron time in min, hour, day, month, day-of-week we set our file path which we want to execute automatically according to date & time. You can edit cron by pressing Insert key from keyboard and to paste your command inside editor you have to press ctrl+shift+v. Now press esc and after that type :wq to save and exit from editor. Step #5. Now check your cron is save successfully or not by typing crontab -l in terminal. Step #6. 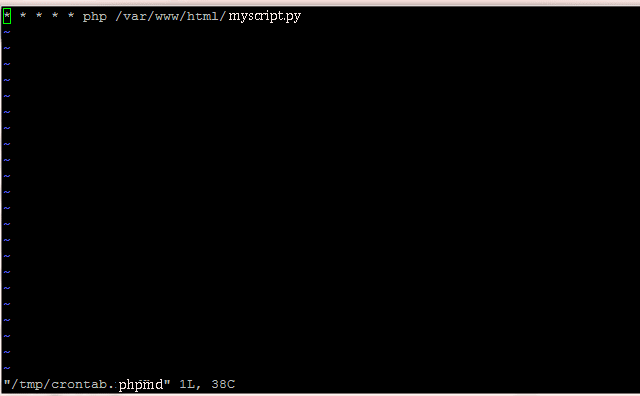 Make sure you change your file permission executing command chmod 755 /var/www/html/myscript.php in terminal. You will get an email every time when your cron will run as per your above php script.